How comfortable are your kids with basic addition & subtraction? How many different ways or visuals can they use to solve a problem? If you feel like your kids need a little more practice to become confident and fluent, don’t resort to boring worksheets. 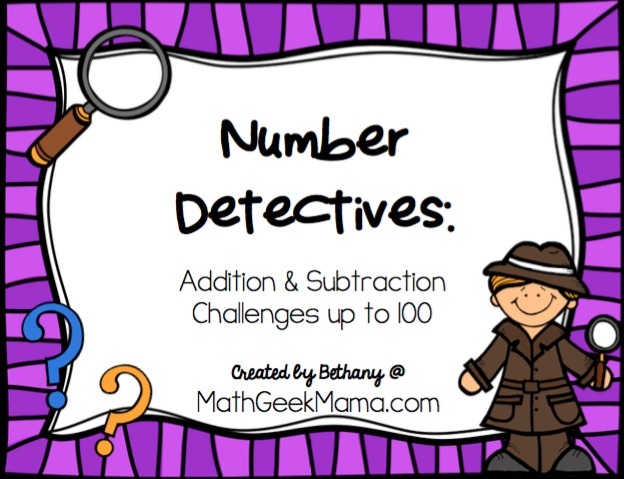 Try the Number Detectives Challenge instead! This engaging activity will provide addition and subtraction challenge problems for kids in kindergarten, first grade or second grade. But even better, this challenges them to think outside the box and in most cases, they will see that there is more than one right answer. The main objective of this challenge is to find all the possible addition or subtraction equations for a given number. And with kids playing the role of detective, they’re sure to be excited to tackle this challenge! To begin, you will need to print and laminate the equation mat. Each student working on this will need their own mat. Then you need to print, laminate and cut out the number cards and they equation cards. The smaller numbers and addition and subtraction signs can be used to build and test out different equations. Finally, print a recording page for each child. This is where they will write all the equations they discover. Once all the pieces are laminated and cut out, kids are ready to solve the mystery. The first challenge for kids is to find as many equations for their given number as possible. To begin, they draw a mystery number card. In the complete set, there are cards for 1-100, but you could always just write out numbers on index cards for kids to use. Just be sure to include a set of numbers that your kids are ready for. For instance, in Kindergarten, you might want to only include the numbers 1-10 for kids to pick from. Older kids might have the numbers 20-40. Once kids have a mystery number, they use the equation building cards to try out different equations. Some kids will like having the cards to use so they can play around and move things around easily. 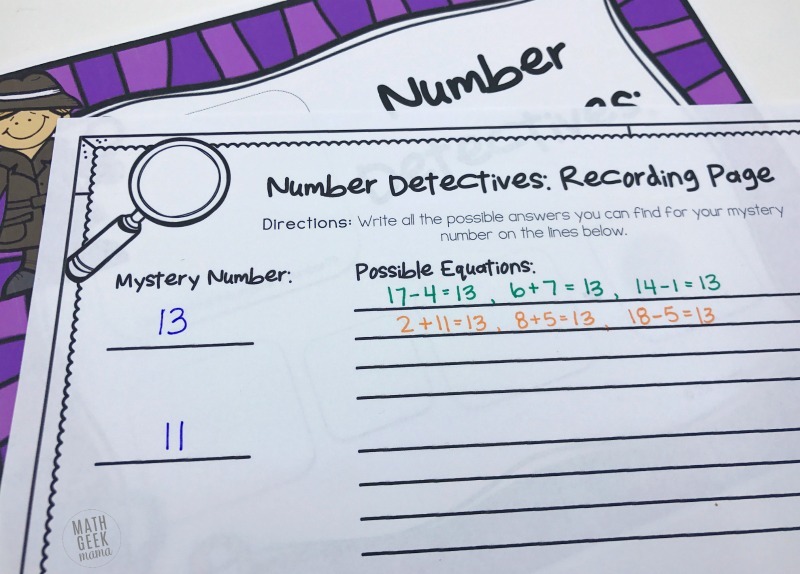 When they feel confident that they’ve found an equation that is true, they can record their answer on their recording page. Some kids might prefer to use a dry erase marker to write equations on the mat rather than using the cards. Just be sure they know to also record them on their paper so they don’t forget their answers. The goal of this exercise is to allow kids to explore addition and subtraction on their own, in their own way. In addition, we want them to notice and discover patterns such as fact families or how many equations there will be for a given number. As kids get older and work with larger numbers, they may notice that the possibilities are endless. Remind them that the goal is simply to find equations that are true and to see if they can find any patterns. You may also want to set some parameters before kids start. For example, maybe require that they find 5 addition and 5 subtraction equations. This ensures they think about both operations. If your kids are ready and feeling a tad competitive, you can turn this challenge into a race. I would not do this when completing the challenge for the first time, but if your kids have done this several times and feel comfortable, this could be a fun alternative. One idea is to place kids in small groups, where the entire group is finding equations for the same number. Then give each group a different mystery number and set a timer for 5 minutes (or less). At the end of time, whichever group has the most correct equations for their number wins. Another idea is to let each child work independently. If you do this, I recommend giving everyone in the class the same mystery number. Then again, set a timer and see who can come up with the most true equations in the allotted time. Also included in the sample and the complete number detectives set are pages of addition and subtraction challenges. 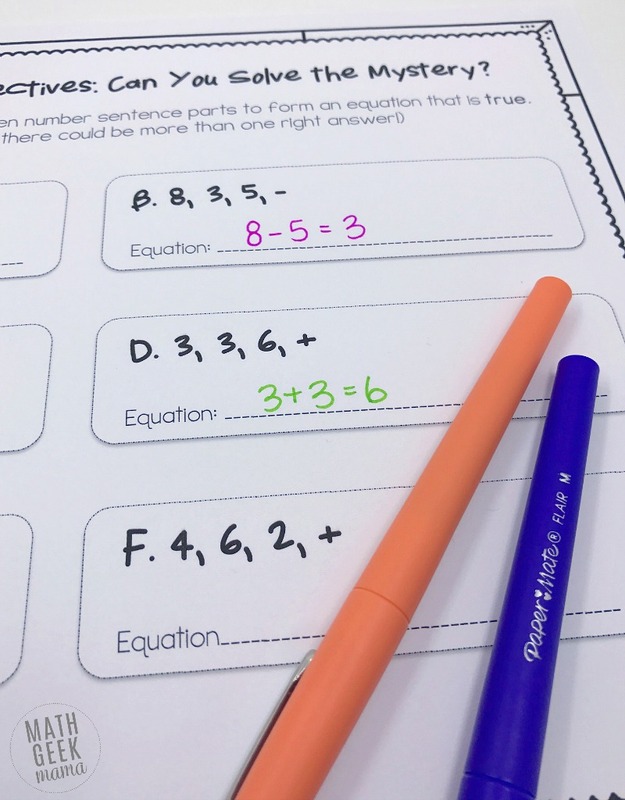 On these pages, rather than asking kids to solve an addition problem, kids are given the parts of an equation. They have to then take those parts and write an equation that is true. Notice that this means there is more than one right answer for almost all the questions. This will help reinforce the commutative property of addition as well as the part-part-whole model of subtraction. Finally, there are also mystery number clue challenges. 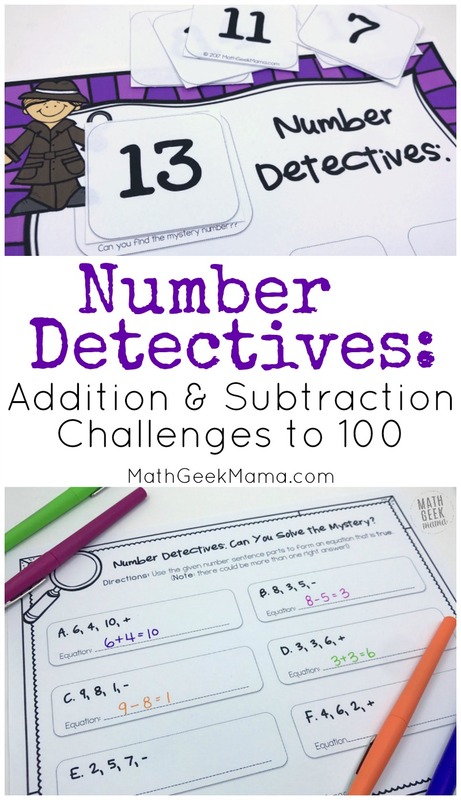 These pages cover a variety of math skills and challenge kids to use the clues to narrow down the numbers. 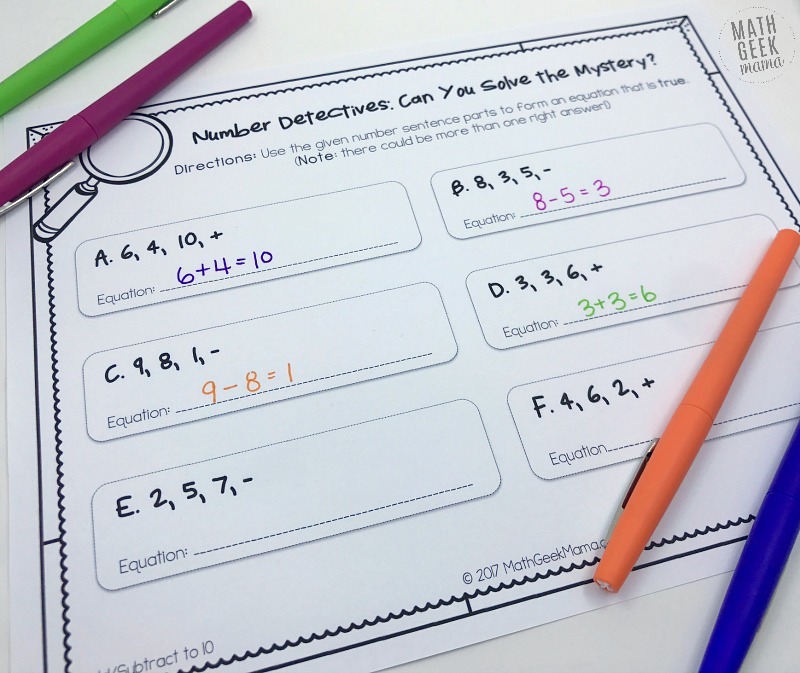 After kids have solved the clues and understand how it works, they can then create their own mystery to challenge their friends with! 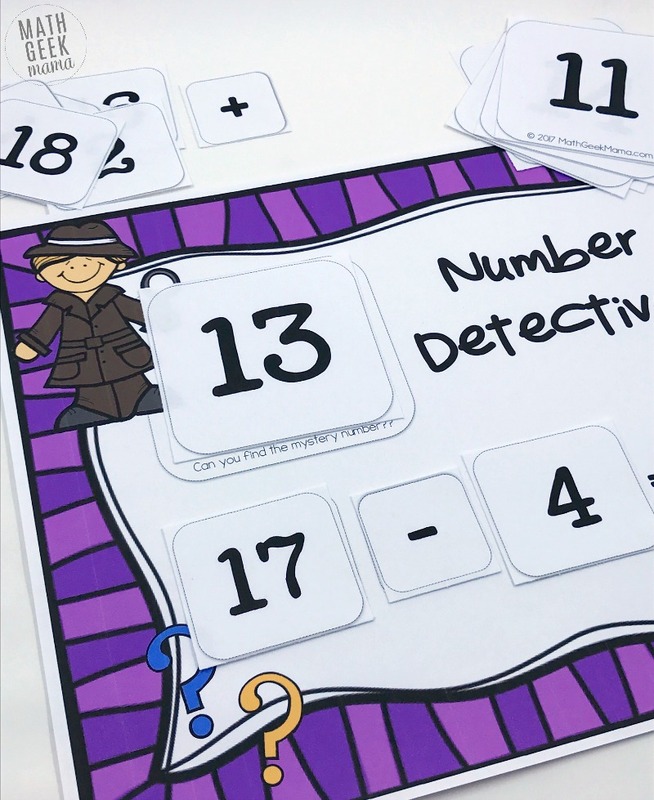 The complete Number Detectives set includes teaching tips and game ideas, the equation mat and all number cards, a recording page, 8 addition and subtraction challenge problems pages, 5 mystery riddle pages, a “create your own challenge” page plus answer keys. If you’d like to try a sample, you can download it at the link below. This includes the equation mat and a sampling of number cards, the recording page and an addition and subtraction to 10 challenge page. What are some of your favorite ways to challenge kids? Share in the comments!